Develop division skills employing this collection of worksheets with in and out boxes, hand-picked for grade 3 kids. 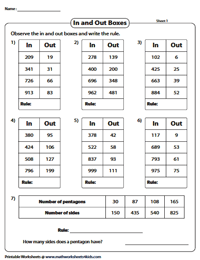 Exercises such as fill the out box using the division rule, understand the pattern and write the division rule, complete the input-output function tables, division function machine and many more; involving 2-digit numbers divided by a single digit in Level 1 and 3-digit numbers divided by divisors up to 20 in Level 2. Solve word problems as well. Work out the quotient by dividing each 2-digit dividend in the in box with the divisor specified in the division rule. 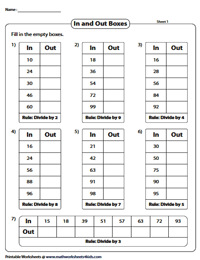 Plug it in the out box to complete this set of in-out box worksheets. Level up with this compilation of worksheets featuring 3-digit dividends in the input box. 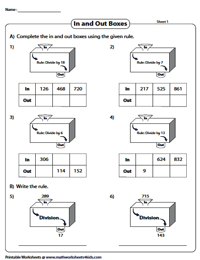 Divide each number by the divisor given in the rule and write the answer in the output box. 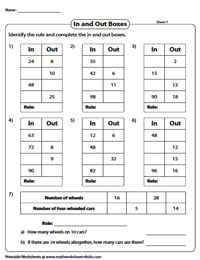 Observe the input-output tables keenly, comprehend the pattern and identify the rule for the six boxes presented in each worksheet along with an interesting in-out function table using shapes, to apply division skills. 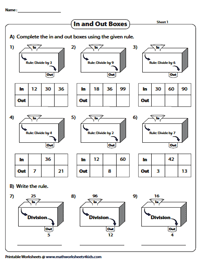 Recapitulate division skills with this batch of grade 3 division worksheets. 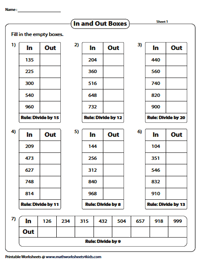 The in-out boxes are filled with the dividends and quotients, figure out the division rule or divisor in each box. This stack of worksheets serves best in testing division skills. Either the input or output of the table is empty, apply the indicated rule and fill in the function table. 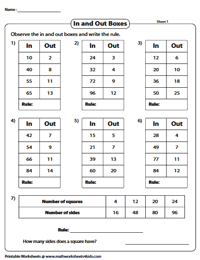 Involving single-digit and double-digit divisors up to 20 and triple-digit dividends, the in-out boxes featured in this unit provide ample practice in division. 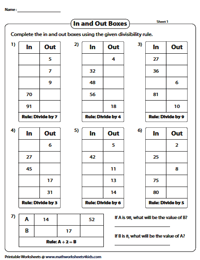 Bolster division skills by plugging in the dividend in the in box or the quotient in the out box or by observing the pattern to identify the rule. 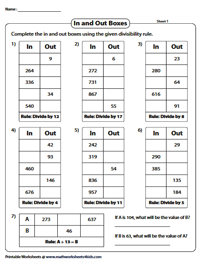 Fill the empty boxes with the correct 3-digit dividend, identify the rule and using the rule find the quotient. Solve a simple word problem at the end of each sheet. Reaffirm division skills by completing the input and output values in Part A and writing the rule for each function machine in Part B. Test division skills with the worksheets presented in Function machine theme. Divide 3-digit numbers with single or double digit divisor up to 20 to find the quotient and also write the rule.